for a great price on a Nissan? Come see us! It's worth your time. Our Priorities for Life program will save you an average of $3,400. Isn't that worth a quick 30 or 40-minute drive? Our customers think so - we think you will, too! Buying a car is a big investment. You want a great value - a good price on a quality car from a dealership with a reputation for taking excellent care of its customers. You'll find all those qualities in Priority Nissan. Even better, you'll find Priorities for Life on every new or used vehicle we sell. And about that drive across the tunnel - just contact us before you arrive and tell us which Nissan you're interested in. We'll have some vehicles ready for you to look at when you get here. And now you get a POWERTRAIN FOR LIFE WARRANTY on Priority Certified Vehicles! Never pay for an oil change again. Not to mention state inspections for life. And if you ever need a tow, it's on us. 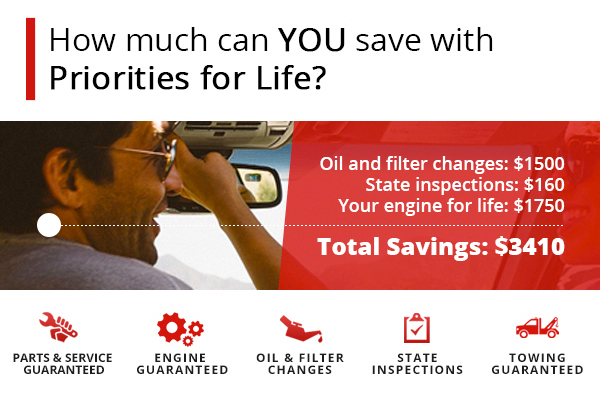 Plus, get your new Priority vehicle serviced at ANY of Priority' s many dealerships! Plus we have Women's Wednesday! Get a free manicure while you wait for you service work to be done. That's an average savings of $3,600 over the life of your vehicle! Isn't that worth the short 40-minute drive to pay us a visit?